Like tech wunderkind Mark Zuckerberg, John Chayka's ascent hatched with a clever idea at a young age that blossomed into a successful business. Now 26, Chayka has become the youngest general manager in NHL history, promoted last week by the Arizona Coyotes. John Chayka's story sounds more like something out of Silicon Valley than St. Catharines, Ont. Like tech wunderkind Mark Zuckerberg, Chayka's ascent hatched with a clever idea at a young age that blossomed into a successful business. 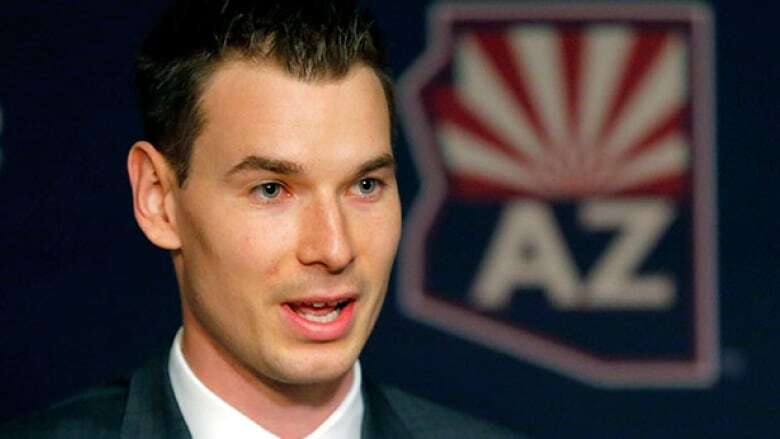 Now 26, Chayka has become the youngest general manager in NHL history, promoted last week by the Arizona Coyotes. "To me, a quote that sums him up was Wayne Gretzky's quote and that is that he goes to where the puck is going to be, not where it is," said Neil Lane, Chayka's long-time business partner and CEO of St Catharines-based analytics company Stathletes. "He's always looking ahead to see where he needs to go, where he needs to be to be ahead of everybody around him." A high-scoring winger and OHL draft pick whose career ended because of a back injury, Chayka started digging into the analytics in hockey well before it boomed into the movement of today. He was just 19 or so, working at a hockey school and hoping to help students with numbers that could better inform their performance. He watched video of their games, logged the numbers by hand and passed on what he found. Lane, a friend with a business, science and math background, transformed the process into something more efficient. The combination of their talents became Stathletes, an analytics company which aimed to make numbers more accessible for everyday hockey types. Chayka and Lane took their idea to the New Ventures Project at Western University's Ivey business school. Heading the course was David Simpson, a former New York Islanders draft pick-turned-professor and perhaps the perfect person to understand the task Chayka and Lane were undertaking. "What I found most interesting about them was that they took it very seriously," Simpson said. "It wasn't just a frivolous project because they really wanted to do this." As players absorbed the data Chayka presented, numbers that demonstrated what they were and weren't doing on the ice, the young co-founders felt they were onto something. Chayka sought out NHL super agent Pat Brisson, travelling to Los Angeles to bounce his ideas and questions off the representative of stars like Sidney Crosby and Patrick Kane. Impressed by what he heard, Brisson helped introduce Chayka to various NHL teams at a point when analytics weren't yet in vogue. General managers were still (and some continue to be) very skeptical of how numbers could help their decision-making process. Stathletes sought to change that. Chayka and Lane asked clubs how they saw the game, then offered the numbers they wanted. It was a hard sell. Where's the stat that tells you whether a defenceman had slow feet? Stathletes could find it, GMs were told, by closely watching and tracking the game. It was the creation of new data in a sport that had, for decades, tracked only the most basic numbers. "It was trying to inform them that they actually see the game in an analytic way," said Lane. "And so it was teaching them that the things that they were seeing were actually very analytical and they were some of the deepest analytical thinkers in the game, they had just never thought to put numbers behind how they were looking at things." Data didn't lie, a lesson Chayka learned at business school. "It doesn't answer all the whys, but it's very effective to give everybody a point of reference to start coming at the discussion," Simpson said. Chayka won't be driven only by numbers, Simpson says. Instead, he'll use it as a large tool in the decision-making process, a resource in dealing with players, coaches, agents and opposing GMs. The Jordan Station, Ont., native is also experienced in seeking outside opinions, as he did in moulding Stathletes services to the specific needs of NHL teams. The Coyotes have created a unique look around him with minority owner Gary Drummond, of no hockey experience, serving as president of hockey operations, and head coach Dave Tippett also serving as executive vice-president of hockey operations. plans to a hire an experienced assistant GM to round out the group. Chayka worked for one season with the Coyotes before they made him the youngest GM in professional sports history. Simpson doesn't think age will preclude him from finding success, given the experienced types around him as well as his willingness to embrace different ideas. Chayka echoed that in his opening remarks by suggesting that the "best idea wins". Running an entire team, though, is different from anything Chayka has tackled. Not only are there the obvious demands of constructing a team under the salary cap, but managing scouts and trainers as well as Tippett. It's a big task for someone who earned his degree from Western two years ago. "I've had the pleasure of seeing it longer than most, that regardless of the age he is, he's had these skills and this ability for a long time," Lane said. "The more time you spend around him the more you realize the gifts that he is possessed with that will allow him to excel in the position."